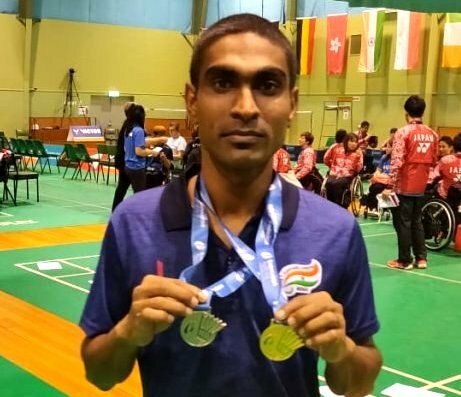 Bhubaneswar: Odisha’s ace Para shuttler Pramod Bhagat bagged gold in Men’s Singles category at the second Fazza Para-Badminton International 2019 held in Dubai from April 2 to 7. He defeated England’s Daniel Bethell in the final. After losing the first set 15-21, the ace shuttler came back strongly (21-18 & 21-13) in the next two sets to clinch the gold. This win has helped Pramod qualify for the Tokyo 2020 Paralympic. The Indian contingent bagged four gold, three silver and two bronze in the tournament. Pramod, a native of Bargarh district, was afflicted with polio at the age of seven. He had earlier won gold in para badminton men’s singles event at 2018 Asian Para Games in Indonesia and bronze medals in singles and doubles event of 4th Turkish Para-Badminton Championship in May 2018.